Paul Shipley, Beth Haenni, Melanie Sizemore: Elizabeth Community Assoc. It's always a good day when you are endorsed by not only two past presidents of your neighborhood association, but the current president as well. I am delighted to have the endorsements of Paul Shipley, Beth Haenni, and Melanie Sizemore. These three have dedicated thousands of hours to the Elizabeth Community Association. Paul has served as Treasurer and is now President. Beth is a past president and a current board member. Melanie is a past president of the association. Like all the other neighborhood leaders and advocates in District One, they know how hard I work for neighborhoods. 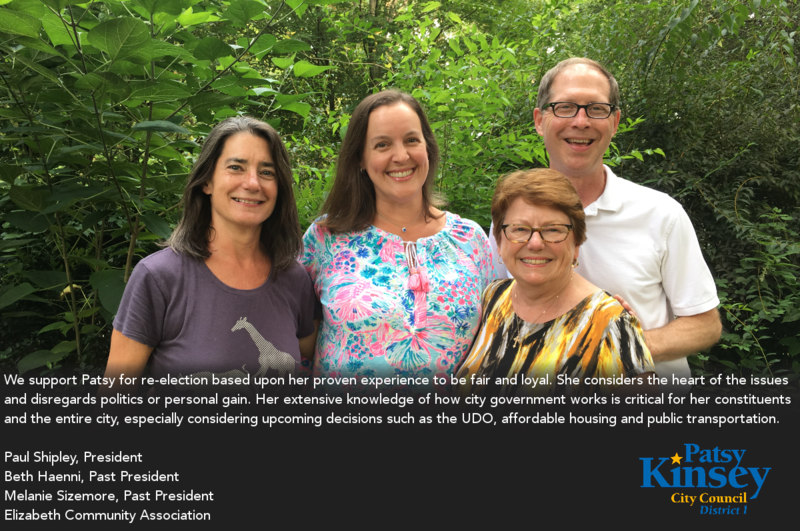 It has been a pleasure working with each of them on different projects for our neighborhood and I am honored that they have chosen to endorse me for re-election. We support Patsy for re-election based upon her proven experience to be fair and loyal to the Queen City's best interests. She considers the heart of the issues and disregards politics or personal gain. Her extensive knowledge of how city government works is critical for her constituents and the entire city, especially considering upcoming decisions such as the UDO, affordable housing and public transportation.